Bone marrow beignets and seaweed doritos. Nuff said. The K-town scene has forever been changed. And no, I’m not talking about an all-you-can-eat barbecue joint that has reinvented a marinade for short ribs. Hidden inside a strip mall in the heart of K-Town is a modern American restaurant called Saint Martha. Look twice and you still wouldn’t believe this place was a restaurant. Sit at the counter. This is the spot where you want to be to see the culinary talent of Chef Nick Erven’s grow. 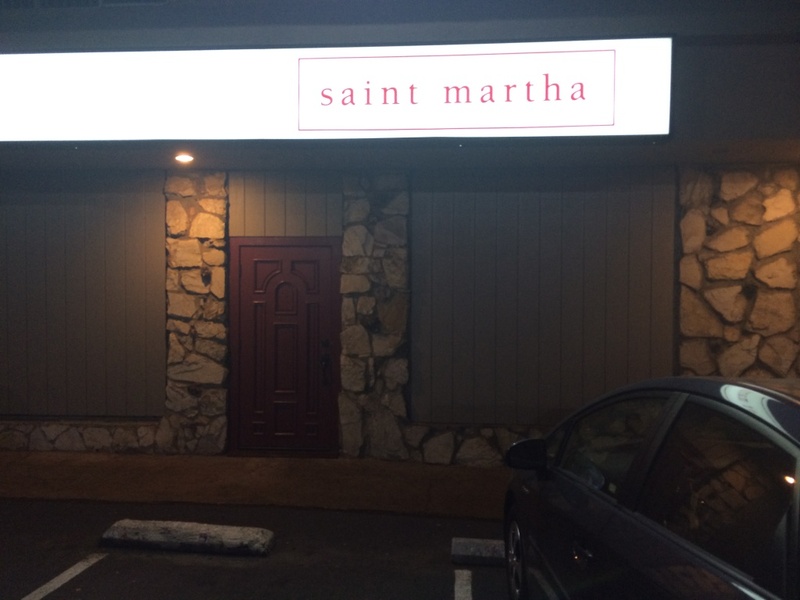 If you prefer something more intimate, the restaurant has many other spots to seat you, but Saint Martha is the cozy, tiny kind of establishment that has an open-kitchen and will greet you. The first dish of the night is sea urchin “tataki” with avocado mousse, hearts of palm and seaweed doritos. Tataki is Japanese for “hit into pieces,” which was the technique used on these little creatures that I have come to be obsessed with. Sweet sea urchin is such a treat, and this one absolutely flaunted its bright flavor. 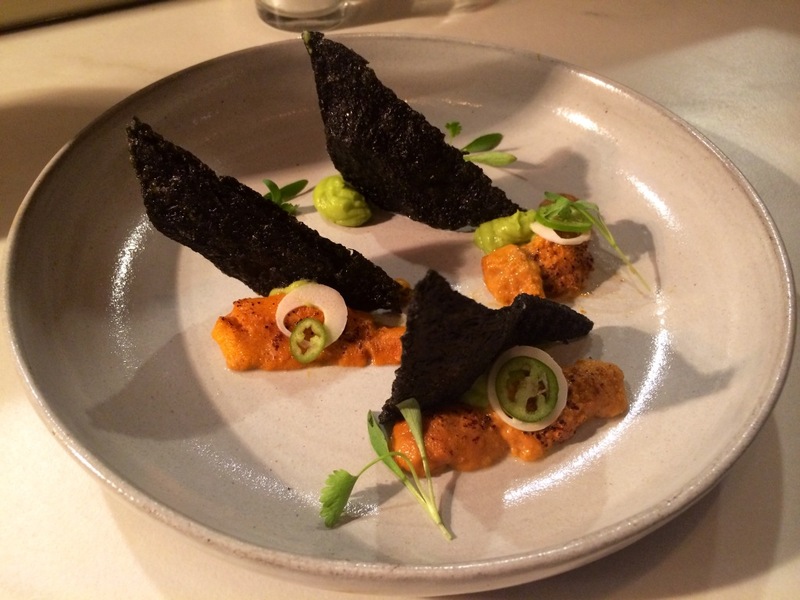 The seaweed doritos were also a very creative treat and their crisp texture contrasted the slippery uni and soft mousse to make a slick dish. This dish reminds me of windsurf boats. 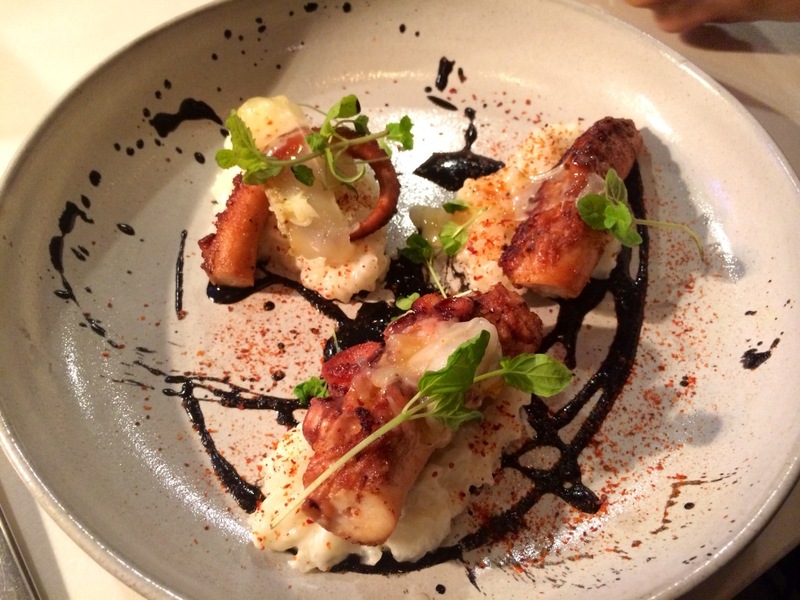 Now what I loved about the octopus with Koshihikari rice, sauce nero, lardo and espelette, aside from the fact that I was unfamiliar with some ingredients, was that it looked like a modern art painting, doesn’t it? The dish can be described as a very fresh — a chewy mollusk over a creamy risotto and that was enough for me. This dish had all the components of brilliance because of its careful preparation and the thought that went into placing all these bizarre elements together. Steak and oyster tartare with champagne sabayon and bone marrow beignets. One of my favorite dishes of the night mainly because I am obsessed with meat, but this was beyond me. The raw beef and oysters were finely minced and worked so well with each other in a brilliant surf and turf design. 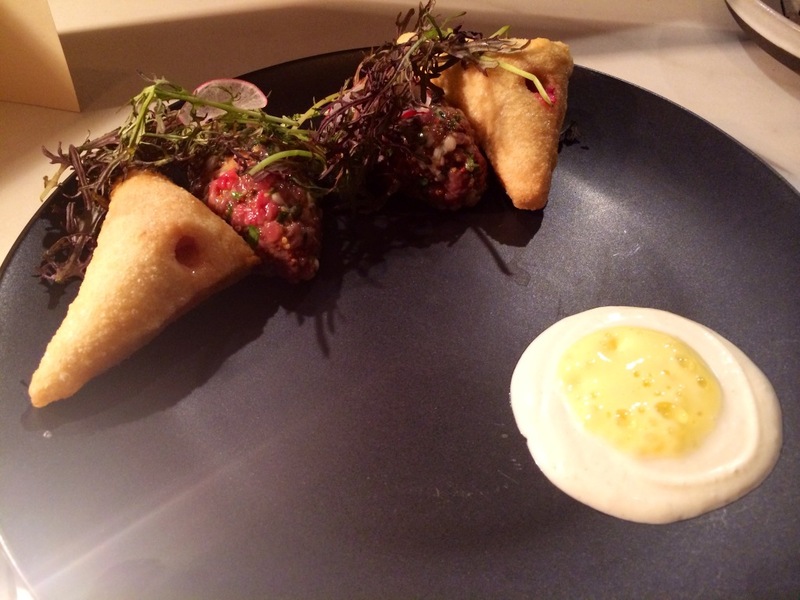 Classic French preparation of the steak tartare is usually dipped with a baguette, but Saint Martha took things to the next level with bone marrow beignets. These pastries were poked after exiting the oil and the soft and spongy “meat butter” was injected. Now take this crazy-good-on-its-own carbohydrate and dip it in the mingling of land and sea and you have what is called a refreshing euphoria. The last dish I will highlight is the dessert. Beets? In a dessert? You thought those were the little things that came out with salad frisée, didn’t you? Well, Saint Martha is on this creative parade and why not try it out in an ice cream format. A scoop of the beets and a bite of the cacao semifreddo were spectacular. I did not feel weighed down by sugar, but instead refreshed in a vibrant way to end the meal. Lots of cool elements just coming together, but please, tell me something that hasn’t already been such a success for this meal. 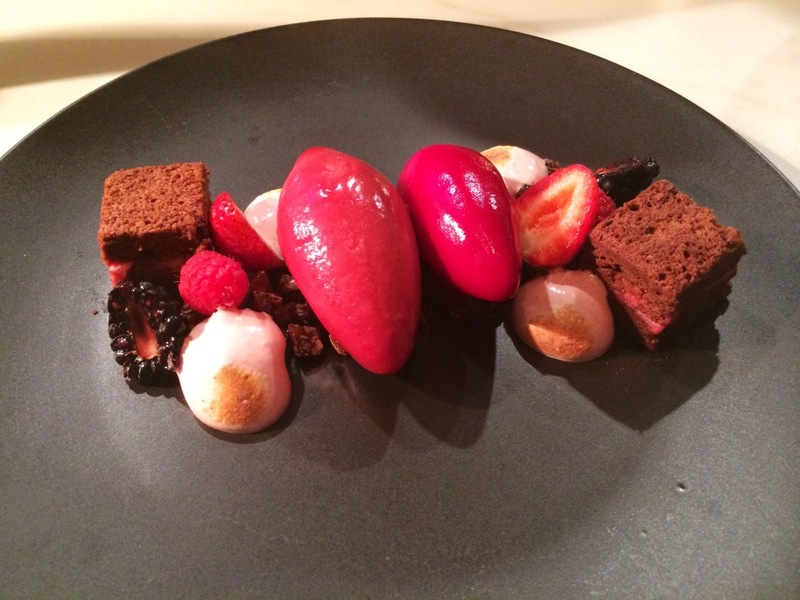 I can’t wait to see what other mind-boggling dishes Chef Nick will design for Saint Martha’s menu.